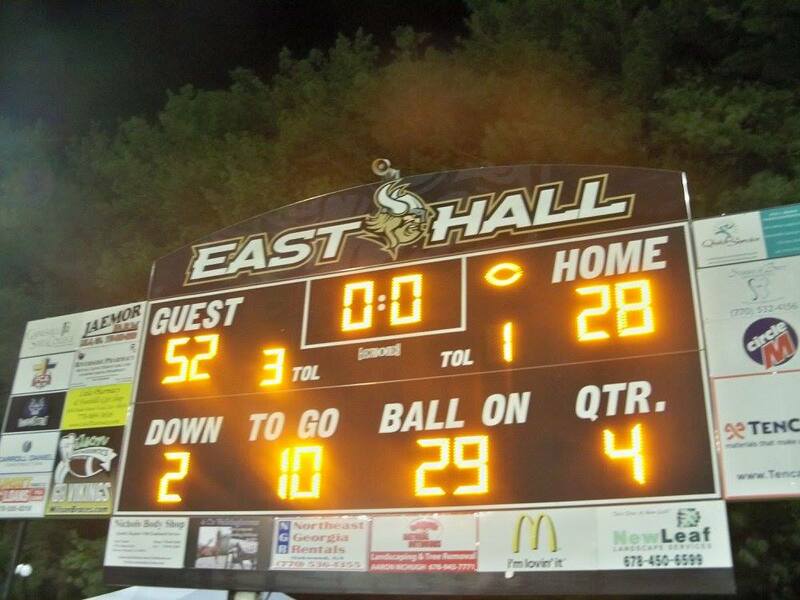 Last night, the PHS varsity football team traveled to Dalton to take on the Raiders of Southeast Whitfield in a crucial 7-AAAA match up. The Dragons came into the ball game with a 4-1 overall record and 1-1 in region play looking to bounce back after a tough loss to Northwest Whitfield the week prior. Pickens won the opening toss and elected to differ to the 2nd half giving the Raiders the first chance at points. It would not take long for Southeast to do just that as Tyler Brown found room on the right side of the defense and got in from 79-yds out. The PAT was missed however giving the Raiders a 6-0 lead with 10:18 left in the opening quarter. 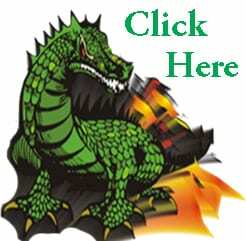 Dillon Gasaway burst through for a 43-yd run on the Dragons possession setting up a 1-yd Chris Pittman touchdown. Ty Chastain’s PAT attempt sailed through and true giving Pickens a 7-6 lead with 8:58 left in the opening frame. Chastain added a 27-yd field goal to make it 10-6 Dragons as we went to the 2nd quarter. Chris Pittman found the end zone from 8-yds out at the 7:41 mark of the first half giving the Dragons a 17-6 lead. After a Caleb Brooks INT, Chris Pittman got past the defense and into the end zone from 19-yds out for his 3rd score in the 1st half stretching the lead to 24-6 with 1:52 to go in the 2nd quarter. The Raiders cut into the lead just before halftime after taking an INT 61-yds to the end zone. A successful two-point conversion gave us a halftime score of 24-14 with Pickens still ahead. 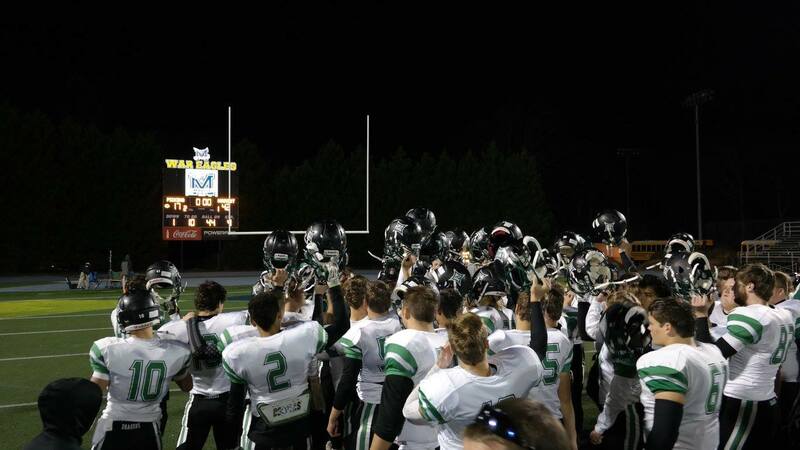 In the 3rd quarter, The Dragons defense swarmed the Southeast offense on every play. 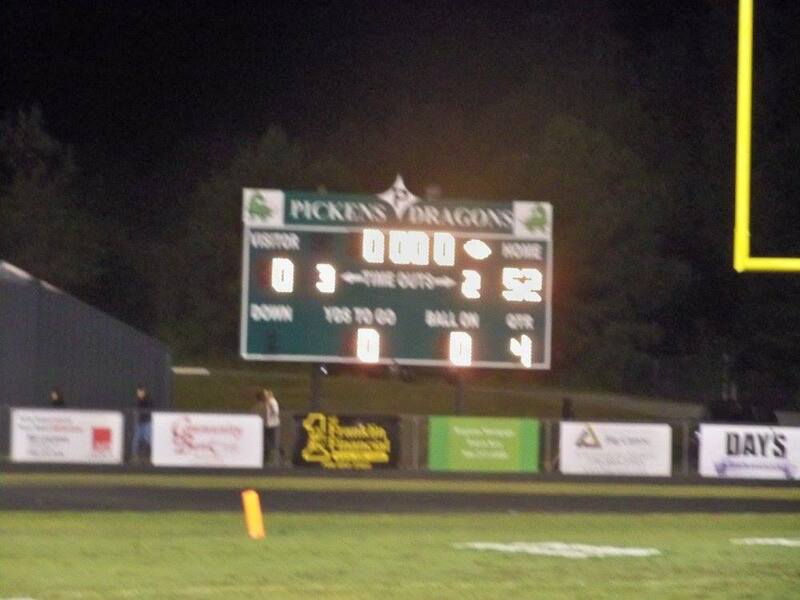 The 3rd quarter ended as it began with Pickens on top, 24-14. In the 4th, Dillon Gasaway made his way into the endzone from 2-yds out giving the Dragons a 31-14 lead with 9:01 remaining in the ball game. 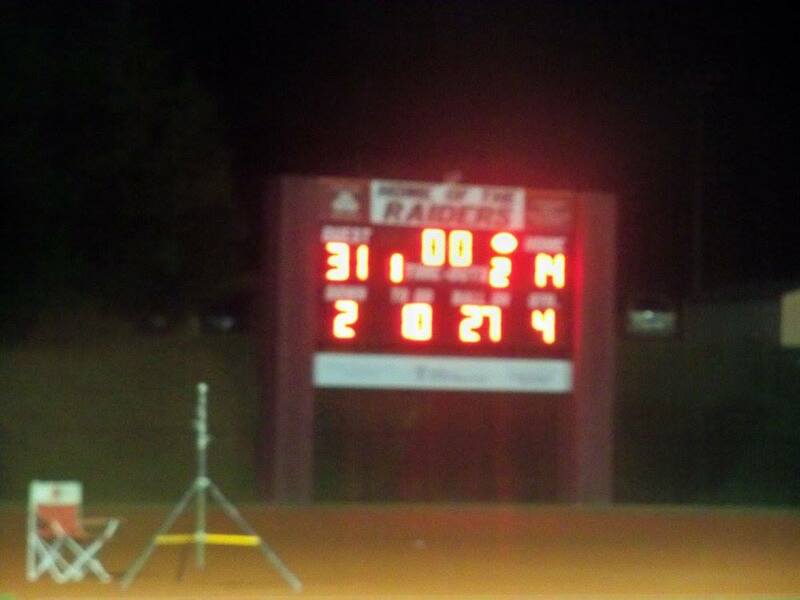 The defense shutout the Raider offense in the 2nd half giving us a final of 31-14. Pickens finished the night with 14 first downs, 4/9 on 3rd down, 0/1 on 4th down. Ran 53 total plays for 312 total yards including 284 yards rushing on 46 attempts. The defense picked off a pass, forced 2 fumbles, & had 3 sacks on the night. 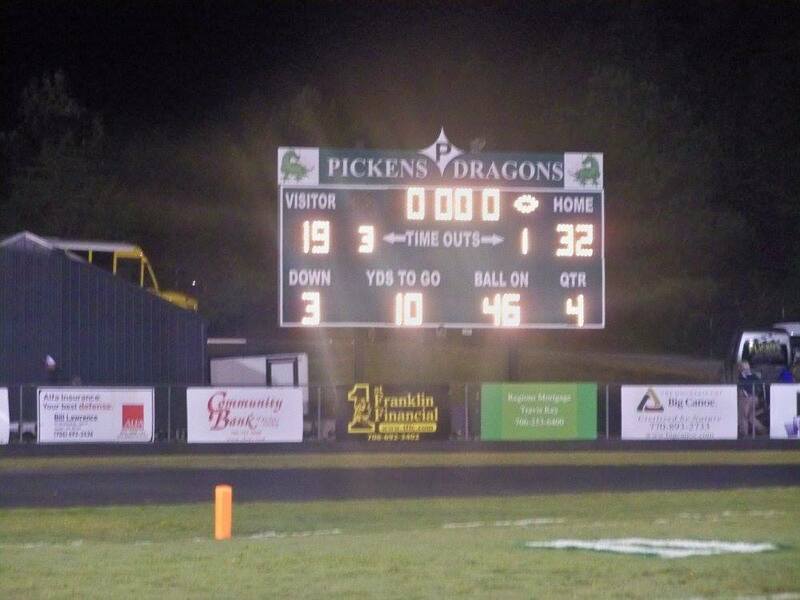 Pickens will finally be home after a 3-week road trip as they will host LaFayette in another 7-AAAA region match up. Next week will be Homecoming for PHS as there will be a week filled with activities and events. 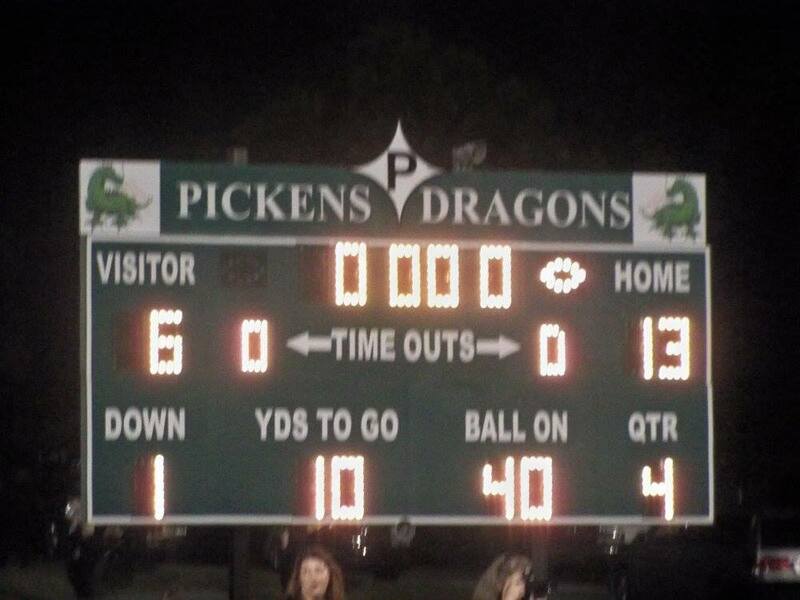 Pickens is 5-1 on the season and are tied with Heritage for 3rd place in the region 2-1. LaFayette is 1-5 on the year and 0-3 in region play.